Claire Vaye Watkins was born and raised in the Mojave Desert. 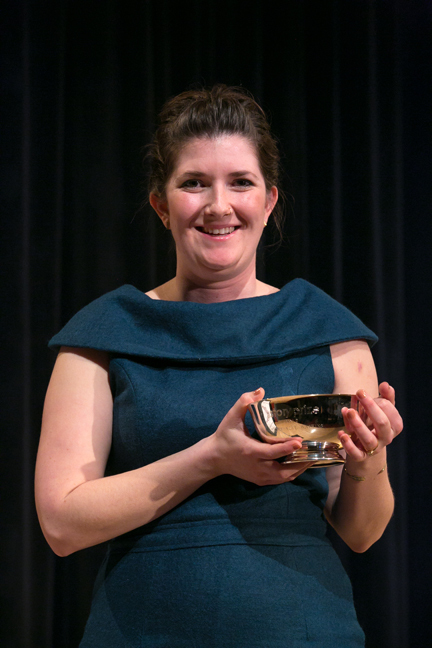 In addition to winning The Story Prize, her debut collection Battleborn (Riverhead Books), has won a Silver Pen Award from the Nevada Writers Hall of Fame, the Rosenthal Family Foundation Award, The New York Public Library’s Young Lions Award, and The Dylan Thomas Prize, as well as earning her inclusion on the National Book Foundation’s "5 Under 35" list. She is an assistant professor at Bucknell University and co-director of the Mojave School, a non-profit creative writing workshop for teenagers in rural Nevada. Dan Chaon is the author of two other short story collections—Fitting Ends and Among the Missing—in addition to Stay Awake (Ballantine Books), and two novels—You Remind Me of Me and, most recently, Await Your Reply. His stories have appeared in many journals and anthologies, including The Best American Short Stories, Pushcart Prize, and Prize Stories: The O. Henry Awards, he has won an Academy Award from the American Academy of Arts, and was a finalist for the National Book Award. He was raised in Nebraska, lives in Cleveland, and teaches at Oberlin College, where he is the Pauline M. Delaney Professor of Creative Writing. Junot Díaz is the author of the short story collection Drown in addition to This Is How You Lose Her (Riverhead Books), and a novel, The Brief Wondrous Life of Oscar Wao, which was awarded the Pulitzer Prize and the National Book Critics Circle Award. He has also won the PEN/Malamud Award and the Dayton Literary Peace Prize, among other honors, and was named a MacArthur Fellow in 2012. Riverhead Books recently published a deluxe edition of This Is How You Lose Her, with full-page, original illustrations for this edition, one for each story, by Jaime Hernandez. Díaz teaches at MIT, was born in the Dominican Republic, and lives in Boston. Krys Lee won The Story Prize Spotlight Award for 2012 for Drifting House (Viking), a debut collection of nine powerful, moving stories set in the U.S., South Korea, North Korea, and often—from the characters' perspectives—the indistinct space between these places. The Story Prize Spotlight Award is a $1,000 prize for a short story collection worthy of additional attention. This is not a judges prize - the Director and Founder of The Story Prize, Larry Dark and Julie Lindsey, select the winner at their discretion from among the regular pool of entries for The Story Prize. The winner of the Story Prize Spotlight Award might be the work of an emerging author, an established but overlooked author, or an innovator in the short story form. Jane Ciabattari is a former president of the National Book Critics Circle, author of the short-story collection Stealing the Fire, and a contributor to Long Island Noir, edited by Kaylie Jones. Yiyun Li is also the author of the story collections Gold Boy, Emerald Girl (a finalist for The Story Prize) and A Thousand Years of Good Prayers, as well as a novel, The Vagrants.